Picture this … it’s a beautiful, sunny day in Alabama, the birds are chirping and all of the sudden you drop straight down and hold on for dear life! It’s not the beginning of a horror film, it’s you at OWA! OWA is a brand new amusement park in Foley that has it all for the thrill seekers in your group. From a white-knuckle roller coaster ride to the classic swings, there is truly something for everyone. If you’re like us and you just want to know which ride is the biggest and baddest, look no further than Rollin’ Thunder. Rollin’ Thunder is OWA’s thrilling roller coaster with ultra-steep drops, flips and tight turns that will leave you screaming with joy. When you want a bird’s eye view of the beautiful park, take a turn on Freedom Flyer. This classic swing ride will have you suspended high in the air and twirling round and round — this is a great ride to hop on right before sunset. OWA didn’t forget about the little ones in your group. There are plenty of rides that are tailored younger thrill seekers. 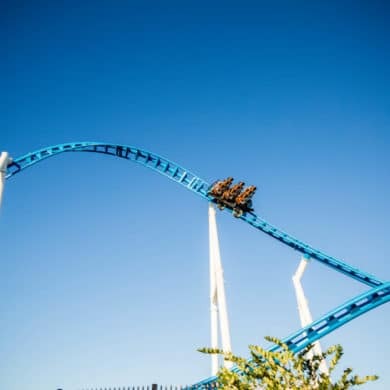 For a full list of rides, make sure you visit the OWA site. When hunger inevitably strikes, it’s good to know that OWA is way more than just an amusement park. The Groovy Goat is a sports bar that has a wide selection of beers on tap, tableside nachos and a full arcade to boot! Just feeling a burger and fries? Wahlburgers has a ton of innovative burgers and other sandwiches that will satisfy the biggest cravings — you might want to wait a while before getting back on the Rollin’ Thunder. Take a break from the beach at OWA.